There is some interesting overlap between the 101, 110, and 150 models. The 150 is fairly common. I have had several pairs pass through my hands, and regularly hear of them "in the field". The 101 and 110 are less so - or at least, I encounter far fewer of them. 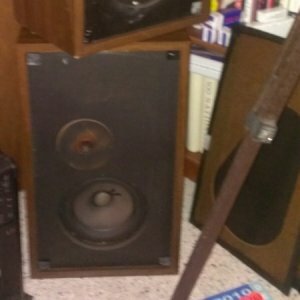 This may not be due to smaller numbers of them being made, so much as the relative care and condition evident in examples of vinyl-clad versus wood veneered speakers this old. The 150 is always 25" x 15" x 11", in real walnut veneer, featuring the vertical anodized aluminum trim and brass colored rings on top. There is no confusion here. I have identical brochures for the EPI 101 and the EPI 110 described as being 20 1/4" x 12" x 8 3/4" - the only difference is the transposition of the "1" in the model name. The 110 sheet is dated 10/78, sadly that very bottom part of the page is not on my photocopy of the 101 brochure. I have a physical example of a speaker of that size labeled "101", with the thin gold-colored metal trim around a foam grill, vinyl-clad cabinet, just as shown in the brochure. It is cut for the early masonite tweeter. I also have a brochure for the 110C listing those same dimensions, from the "gold ring" tweeter era. This is definitely real. It shows a wooden frame style grill that protrudes slightly past the front of the cabinet. I also have photographs of a customer's vinyl-clad speaker, clearly labeled "110", that measures 24" x 14 1/4" x 10 1/4" - almost the same as a 150 - and is built in a fairly early style: a masonite tweeter, woofer mounted on an inset board behind the baffle, and drivers mounted low in the baffle, just like the 150. If it was built as a vinyl version of the 150, the slight dimensional discrepancy is likely due to the differences in how veneer and vinyl-clad cabinets are made - the vinyl ones are made using a "v-grooving" process, where both sides and the top and bottom are cut from one long piece of vinyl-clad material, with a "V" cut at each junction leaving just vinyl, which acts as a hinge for rapid assembly. Final product dimensions were often tweaked to maximize board usage efficiency. Make of this what you will. I suspect the model was introduced as the 110 (as a vinyl version of the 150), and then later a new intermediate-sized model (larger than the 100, smaller than the 150) was to be called the 110, and then changed to the 101 to avoid conflict - especially if the larger 110 was still in production, or at least in inventory. These variations could easily have been regional, or specific to one retailer or category of retailers. It is even possible that the "110" brochure I have represents something that never made it to the marketplace, although that is unlikely because it was sent to me by a customer, who would have acquired it through a retail channel. 20 1/4" x 12" x 8 3/4"
25" x 15" x 11"
As mentioned above, in the end, these distinctions or overlaps are only really of historical interest - the parts used in the speakers are all identical in function (they vary a bit in some ways by generation), and the new parts I make to rebuild and upgrade them are exactly the same for all three models. 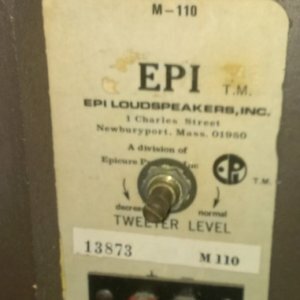 As an aside, I have seen some early EPI models badged as "Epicure" speakers, with that being the only difference. This was likely an early development of the cosmetically unique first line of Epicure models.